If you’re looking to update a room with a fresh, modern look, then try these fun, no-sew “shades.” You make this shade with adjacent squares of paper covered with clear Contac paper, which is a great material to work with for many reasons: It allows in light, while still offering some privacy, and it’s cheap and easy to use, so you can change your mind often, or redecorate your window for each season, holiday, whatever your whim. This simple project gives any informal room a fun feeling. Consider making this shade for a modern bedroom, where the square panels are echoed elsewhere in your decor. Try it in a child’s bathroom or bedroom; it’s a great opportunity to let your kids’ artwork have a better place to shine than the refrigerator door. To create a hanging window shade, apply clear Contac paper over equal-size pieces of paper, which laminates the images so they stay in place and the shade pieces maintain their integrity. A hanging window treatment can give your room a fresh, modern look. Any kind of interesting paper that matches your décor. Some ideas include colorful construction paper, a color-page sheet from a newspaper (check out foreign-language newspapers if you’re matching an ethnic decor), beautiful wallpaper or wrapping paper, vintage greeting cards, color copies of photos, images from children’s books, or anything you like. For kids’ rooms, try spelling out names, words, or messages by using a letter on each Contac-covered square. 1. Measure your window length and width. 2. Figure how many identically sized squares you need to reach your windowsill, interspersed with 2-inch clips between each square. Try 4 x 4-inch squares because they break down nicely for a 30 x 60-inch window and provide a variety of images. For a window of this size, use about seven or eight rows of squares, and they’ll be ten squares long each, with 2-inch paper clips between each square. You can do the simple math; now get cracking on finding all those images! Because paper clips can vary in style and color from company to company, use all your paper clips from one box for a uniform appearance. 1. 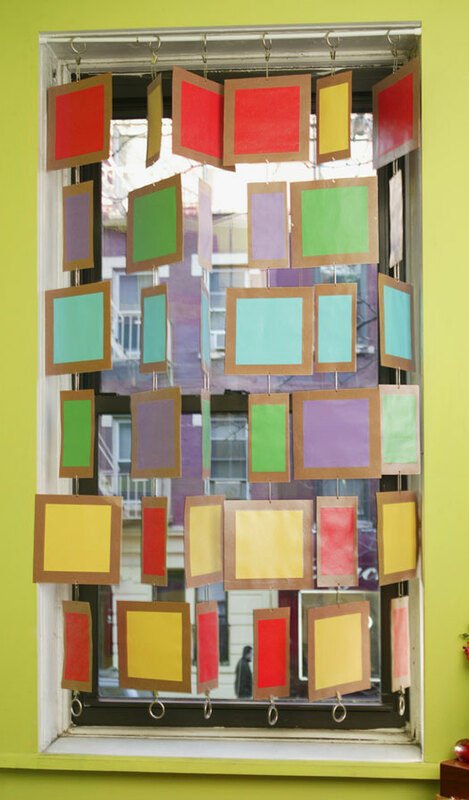 Cut your decorative paper into 4 x 4-inch squares, enough to fill your window. 2. Apply one layer of the clear Contac over one side of the decorative paper and then the opposite side. Doing so “laminates” the image, suspending it between the Contac paper. 3. Cut the Contac paper–covered image leaving a 1/2-inch edge of Contac around each square. 4. Punch a hole at the top and bottom of each square, being sure to keep the holes within the 1/2-inch of clear Contac paper. 5. Arrange the squares in columns and attach with large paper clips. Be sure to only punch one hole at the top for the bottom squares. 6. Attach the top paper clips to your curtain clips. 7. String along your rod and hang.